This article contains facts and information about the life and times of the famous Native American Indian chief known as Sacajawea. Who was Sacajawea and why was this Native Indian so famous? Summary: Sacajawea (c.1786–1812), also known as Sacagawea, was famous as a female Shoshone Indian guide and interpreter. She guided the Lewis and Clark expedition through the wilderness and across the Rockies from 1804–1806. On April 7, 1805, Sacajawea showed qualities which became her trade mark throughout the journey – calm and self-possessed. When their boat was going through the Missouri River, a storm hit the boat that the group was riding on. It keeled over and almost turned upside down. The men tried desperately to right the boat and gain the vessel’s balance. Sacajawea on the other hand did not show any sign of panic. Instead, she tried to save every document and book that they had on the boat and wrapped it in waterproof cover. As a result, even when the documents and the books fell into the water, not one of them got wet. 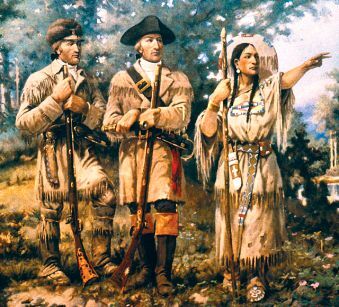 Sacajawea was held in high regard by the expedition members and was respected for being hardworking, intelligent and loyal. Sacajawea! Discover the vast selection of pictures on the subject of the tribes of Famous Native Americans such as Sacajawea. The pictures show the clothing, war paint, weapons and decorations of various Native Indian tribes, such as the Shoshone tribe of Sacajawea, that can be used as a really useful educational resource for kids and children of all ages studying famous Native Americans such as Sacajawea. We hope you enjoy watching the video - just click and play - a great educational resource for kids.